Dave Mustaine’s Gigantour 2013 touched down at The Constellation Brands-Marvin Sands Performing Arts Center, (CMAC for short), this past Saturday. The blistering heat made for an uncomfortable afternoon but helped sell a ton of beverages to help cool things down a little. Stagehands and techs helped keep the changeover between acts to a minimum and seemed to be running smooth when transitioning one act to another. Megadeth headlined the affair, with the heavy riffs of guitarist, vocalist Mustaine and guitarist Chris Broderick coupled with the solid rhythm section of original bassist David Ellefson and drummer Shawn Drover, they helped put an exclamation point on the concert that began at 4:30 PM. 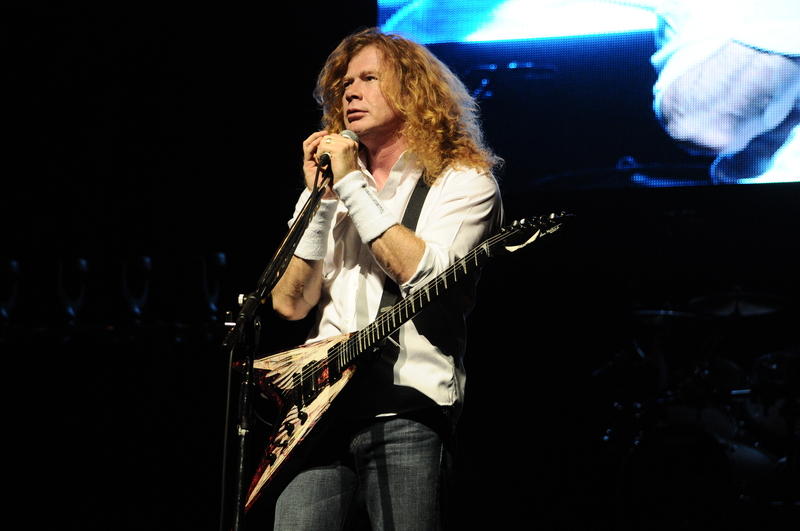 Megadeth opened with a pair of trusted tunes in “Trust” and “Hangar 18”. Having seen Megadeth in the past, I must say this was the best performance I had seen to date. A huge projection screen was suspended in the air behind drummer Drover, and two more screens, one on each side ground level, flashing images, playing video clips and gave the show an added touch. With an enormous stage to move around on, Mustaine took full advantage as he moved around at will and took turns using different microphones at times depending on where he was when his snarling vocals were needed. Closing out the main set with perhaps their two biggest songs in “Symphony Of Destruction” and “Peace Sells”, the band left the crowd begging for more. The band obliged as Mustaine led the band out for an encore of an old Thin Lizzy song “Cold Sweat” and “Holy Wars… The Punishment Due”. Zakk Wylde and his band Black Label Society went on just before Megadeth and delivered a solid one hour set which saw Wylde play a few solos that the crowd ate up. The band opened with “Godspeed Hell Bound” and despite a muddy sound mix especially with the vocals the band were able to warm up the crowd for Megadeth. By the time BLS were finished playing the seats under the pavilion filled in to a decent amount compared to earlier in the day. Device, the new project featuring Disturbed leader David Draiman was up and delivered perhaps the best sounding set of the day. Draiman came out wearing a long black trench coat which he promptly shed by the second song and commented how ridiculously hot it was. Draiman admonished two female spectators in the crowd for just sitting there and gave them an ultimatum by either standing up or leaving. Draiman led drummer Will Hunt and guitarist Virus through a fast paced set that featured “Vilify” the single that has received a ton of airplay on alternative radio. Draiman also brought up a young fan on stage who he had noticed rocking out in the crowd. He found out it was the nine year-old’s first ever concert, I would say he will forever remember everything that went down this day. Hellyeah, the band featuring former Mudvayne members singer Chad Gray and guitarist Greg Tribbett as well as former Pantera and Damageplan drummer Vinnie Paul were up third. The uninspired crowd may have seemed calm earlier in their set but by the end Gray had the crowd pumping their fists in the air as they left with a strong finish. Newsted, led by former Metallica bassist Jason Newsted were one of the surprise acts of the day as they drew a great response. Newsted gave the crowd several salutes and devilish facial expressions throughout his all too brief thirty-minute appearance. Newsted also played a new song “…As The Crow Flies” from the band’s forthcoming debut album entitled Heavy Metal Music. Keep an eye on this band as they are on the verge of something big. Death Division, a band managed by Mustaine’s son Justis, opened the show and put on a solid show even though clocking in at a mere twenty-five minutes. Overall Gigantour has perhaps, the best lineup of bands out on the summer tour circuit this summer. Despite blistering temperatures and high humidity the bands gave it their all and delivered a high quality show. I would recommend anyone who likes their music loud, hard and raw to catch this tour when it hits a town in your vicinity. You won’t be disappointed.